To evaluate' and develop medium frequency communications technology for emergency underground mine communications. Medium frequency communications systems do not require a powered underground infrastructure to be installed for operation, and may therefore provide a higher degree of survivability after a mine disaster than other types of systems. In June 2006, Congress passed the Mine Improvement and New Emergency Response Act (MINER Act), mandating that underground coal mines provide emergency response plans that include two-way wireless communications and electronic tracking systems within three years. To satisfy that legislation a wide variety of communications systems have been developed to meet the guidance set forth in the Mine Safety and Health Administration (MSHA) program policy letters that followed. In the years following the MINER Act of 2006, the National Institute for Occupational Safety and Health (NIOSH) supported the development of different types of communications and tracking technologies. Most underground mine communications systems use hand-held, high frequency radios similar to systems used on the surface. These high frequency systems require the installation of underground powered infrastructure that is susceptible to damage from events such as roof falls and explosions. In contrast, medium frequency (MF) systems use existing mine conductors for communications, such as underground transport rails and mine power cables, which have a better chance of remaining intact after a mine disaster. 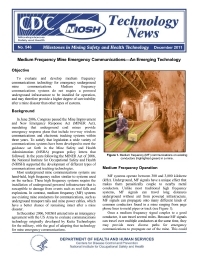 In December 2006, NIOSH entered into an interagency agreement with the US Army to evaluate communications technology originally developed by Kutta Technologies for the military, with the goal of adapting that technology for mine emergency communications.